Kathy Adams Clark, whose work has appeared in the New York Times, Birder’s World, and National Geographic Books, is one of the top nature photographers in Texas; with her husband, writer Gary Clark, Adams has published Backroads of the Texas Hill Country, Birds of Southeast Texas and the Upper Texas Coast, and, most recently, Photographing Big Bend National Park. But until last September’s publication of Portrait of Houston, Clark had never produced a book of photography about the city she’s called home since 1983. 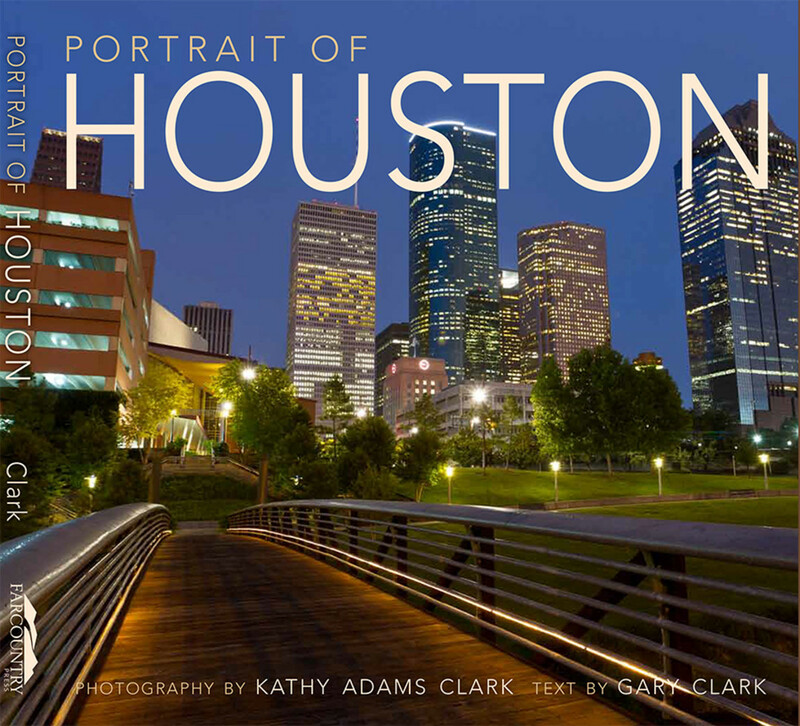 The Montana-based publisher Farcountry Press approached Clark several years ago with the idea to do a photography book about Houston. Clark has been photographing the city for years, but because of how fast the city is changing she knew the book would require a whole new set of shots. Clark also tried to capture what she calls the “multi-ethnic flavor of the city”; one photograph she took at the Houston Livestock Show and Rodeo shows a group of Hispanic children wearing purple boots and cowboy hats. Her favorite photograph in the book is an aerial shot of the San Jacinto Monument with the Battleship Texas in the background. Clark took the cover photograph, a view of the downtown skyline at dusk, from a pedestrian walkway along Buffalo Bayou. Although Clark and her husband will be discussing Portrait of Houston tonight at Brazos Bookstore, they are already hard at work on their next project, a book about the birds of Texas for Texas A&M Press. Just as with the books, Clark collaborates with her husband on his popular weekly nature column for the Houston Chronicle and San Antonio Express-News. The column, which has been running for 14 years and appears every Saturday, is written by Gary Clark with photography from Kathy.